Can you help her in tomato farming as she is too young and needs someone's help? Firstly, help her in understanding the stages of tomato farming. Then help her in making tomato seeds suitable for growing plants. 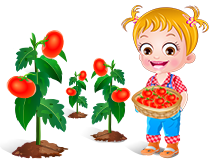 Join her to pick tools and supplies required for tomato farming.